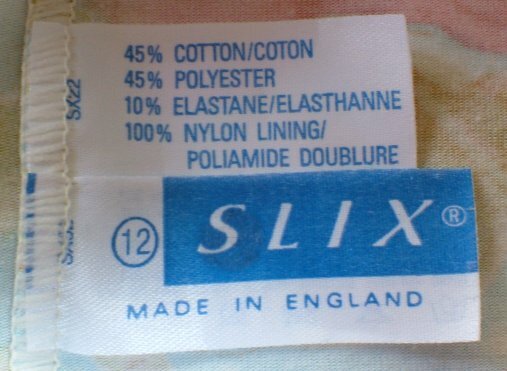 1960s vintage boy-leg flowered cossie by Slix. This might have been considered a bit fuddy duddy in its own time - it can't compare to an itsy bitsy bikini - but with the low back and boy leg-shape, it's right up to the minute for the twenty-first century! Slix have been making swimwear since 1937, always concentrating on making women feel both glamourous and secure. I consider this a flattering suit, even by today's exacting standards! The fabric is a mixture, but 45% cotton, and this is the feel of the suit. Although this fabric has two-way stretch, the garment will feel much looser on the body than a modern lycra costume would; although I'm sure it would still withstand any number of laps of your local pool! The pattern is as pretty and as colourful as the pictures show, with pink, splashy flowers on a ground of blue, cream and green; and I believe the photographs do the costume justice. It has minimal bust support - an elasticated panel - and is probably about a modern size 10, possibly a small 12. Measurements unstretched are, length of back 13½ ins/34 cms, bust 30 ins/76 cms, hips 34 ins/86 cms.